In today’s digital climate, small business is faced with many challenges that appear to be increasing. These challenges are being amplified due to the pace at which digital marketing is changing. Coupled with these digital marketing complexities is the migration of how consumers are accessing the internet, and the main devices they are using to do so. For the first time, mobile devices are eclipsing desktop internet access and this is no fad. When we look at the facts, we find that 80% of internet users search the internet on smartphones and 47% are using tablet devices. Pretty shocking numbers to most small and local businesses and it gets even more dramatic. Only 67% of small businesses have a website that is optimized for mobile devices. 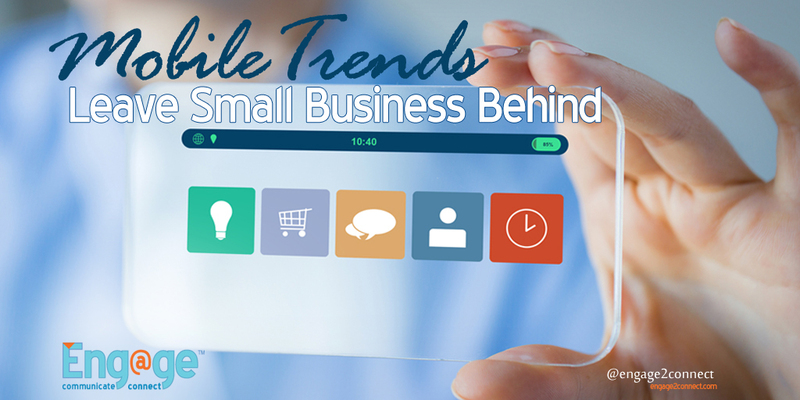 The fact is that local businesses are just not keeping up with the requirements of small business mobile website trends and it is affecting their ability to compete. With search engines penalizing websites that are not mobile friendly, most small companies are being left out of search results when users are accessing via a mobile device to a local small business mobile website that isn’t optimized for mobile visitors. The problem is that most small businesses are not even aware of this situation and therefore leave them struggling when it comes to their digital marketing efforts. Nearly half of consumers start on mobile to search and investigate brands and products. Consumers spend 2.8 hours per day (51% of their total online time) on their mobile device, compared to 2.4 on desktop. Mobile users spend 20-50% more than desktop purchasers. Consumers today are far more spontaneous with their research. Many multi-task their mobile activity, while doing other tasks such as watching TV. When not in the office, users also tend to use their mobile devices to discover places to eat or shop. Non-mobile optimized small business mobile websites do not translate well on small screens. If your customers can’t view and engage with your site easily, they leave. Small and local businesses face many challenges operating in today’s digital business climate. Keeping up with trends, digital marketing changes and the latest requirements of social media, SEO and paid marketing components are just a few. When you add to these the technical complexities, many small businesses are just not able to keep up with the mobile website issue. 2 – 55% say that having enough time is a top business concern. 3 – 40% of small business owners say that retaining customers is a concern priority. 4 – 30% say that keeping up with technology advances is a major concern of small business owners. 5 – 32% are extremely concerned with simply paying the bills. Being a small business owner comes with many challenges and keeping pace with larger businesses online is certainly one of them. Based on the concerns that small business owners are faced with today, it is no wonder that they are being left behind on the mobile web without a small business mobile website. Local brands and small businesses are at a crossroads of sorts with respect to digital marketing and their small business mobile website presence. Proper digital marketing strategies, platforms and technologies are increasingly becoming the required norm. Things like mobile websites, social media marketing, organic and paid search marketing along with email marketing and video have now become standard practices for thriving businesses of all sizes. This has also become true for the small local business. Do you need a small business mobile website that is optimized for your local customers? We can help!